Date of publication of the official Valid Standard: 27.11.1989. Brief historical summary : Its origins are confused with those of the Maltese, because its distant ancestors are the same little dogs mentioned in Latin by Aristotle (384-322 BC) under the denomination of « canes melitenses ». Already known in the Roman era, the Bolognese appears most especially among the very appreciated gifts which were made during a whole era by the powerful of that world. Cosimo de Medici (1389-1464) brought no less than eight to Brussels as gifts to as many Belgian noblemen. Philipe II, king of Spain from 1556 to 1598, after having received two as a gift from the Duke d’Este, thanks the donor in writing saying « that these two little dogs are the most royal gifts one can make to an emperor ». Bolognese are represented in paintings of Titian, of Pierre Breughel called le Vieux and Goya. 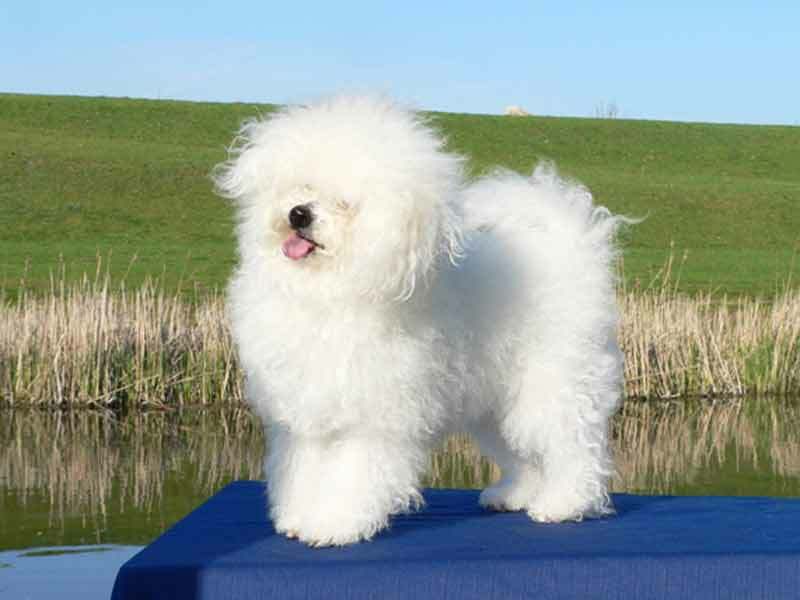 General Appearance : Small size, stocky and compact, covered with a pure white coat, long and fluffy. Important Proportions : Square built, the length of the body being equal to the height at the withers. Behaviour / Temperament : Very serious, generally not very active. Enterprising, docile, very much attached to his master and his entourage. Head : Of medium length reaching 1/3 of the height at the withers. Its width, measured at the level of the zygomatic arches is the same as its length. Skull : Of slightly ovoid (egg-shaped) shape in the sagittal direction and rather flat in its upper part, has rather convex sides; the protuberances of the frontal bones are well developed - The longitudinal axes of the skull and muzzle are parallel; the frontal furrow is only slightly accentuated and the occipital protuberance only slightly marked. The length of the skull is slightly more than that of the muzzle. Nose : On the same line as the topline of the muzzle; seen in profile, its front side is on the vertical. Is large and must be black. Muzzle : Its length is equal to 2/5 of the length of the head; the topline of the muzzle is straight and the sides of the muzzle are paralell, so that the forepart of the muzzle is almost square. The lower orbital region is well chiselled. Lips : Upper lips being hardly developed in depth, they do not cover the bottom lips, and the lower profile of the muzzle is determined by the lower jaw. Jaws/Teeth : Jaws normally developed, with top and bottom arches perfectly adapted. Teeth white, evenly aligned, with strong and complete dentition. Articulation of incisors as scissor bite; pincer bite tolerated. Eyes : Set on an almost frontal plan; well opened, of superior to normal in size. Eyelid opening is round; the eyeball must not be prominent; the white of the eye is not visible. The rims of the eyelids must be black, and the iris of a dark ochre colour. Ears : High set, they are long and hanging, but rather rigid at their base, so that the upper part of the external ear is detached from the skull, giving thus the impression of the head being larger than it really is. Neck : Without dewlap; its length is equal to the length of the head. Body : The dog being of a square construction, the length of the body, measured from the point of the shoulder to the point of the buttock bone is equal to that of the height at the withers. Withers : Only slightly prominent from the top line. Top line : The straight profile of the back, and that of the loin, slightly convex, merge harmoniously in the line of the croup. Croup : Very slightly sloping; is very wide. Brisket : Point of the sternum (manubrium) only slightly prominent. Chest : Ample, let down to level of elbows, with well sprung ribs, the height reaching almost half of the height at the withers. Underline : Following the profile of the sternum, then rises slightly towards the belly. Tail : Set in the line of the croup, carried curved over the back. General appearance : Considered on the whole, they are perfectly straight and parallel in relation to the median plane of the body. Shoulders : The length of the shoulder blades is equal to 1/4 of the height of the withers; in relation to the horizontal, they are slanting and are near the vertical in relation to the median plane of the body. They are well free in their movements. Upper arm : Well joined to the body, of an almost equal length to that of the shoulder, but less slanting. Elbows : They are on a parallel plane to the median plane of the body. Forearm : Its length is equal to that of the upper arm; follows a perfect vertical direction. Pastern joint and Pastern : See from the front, they continue the vertical line of the forearm. Seen in profile, the pastern is a little bit slanting. Forefeet : Oval shaped, with well cushioned dark pads and very hard black nails. General appearance : Considered on the whole and viewed from the back, they must follow from the point of the buttock bone to the ground a perfectly vertical line - they are parallel to each other. Upper thighs : Their length is equal to 1/3 of the height of the withers. They are slanting from top to bottom and back to front and perfectly parallel to the median plane of the body. Lower thigh : Is longer than the upper thigh. Hock joint : The tibia-tarsal angle is not very closed. Hocks : The distance from the point of the hock to the ground is slightly less than a third of the height at the withers. Hindfeet : Same characteristics as the front feet, but less oval. Gait / movement : Free, energetic, with a noble and distinguished head carriage. Skin : Well taut and welded to the body all over, the visible mucuous membranes and the third eyelids strictly pigmented black. Hair : Long all over the body, from head to tail, from the top line to the feet. It is shorter on the muzzle. Rather fluffy, thus not lying flat, but in flocks; never forms fringes. Colour : Pure white, without any patches nor any shades of white. Height at the withers : Males 27 to 30 cm. Females 25 to 28 cm. Weight : : from 2,5 to 4 kg. Accentuated convergence or divergence of the upper longitudinal axes. Prognathism, if it alters the outer look of the muzzle. Size under 25 cm and more than 33 cm in the males and under 22 cm or more than 32 cm in females. Nose of any other colour than black. Bilateral depigmentation of the eyelids. Shortened tail whether natural or artificial. Any other colour than white.